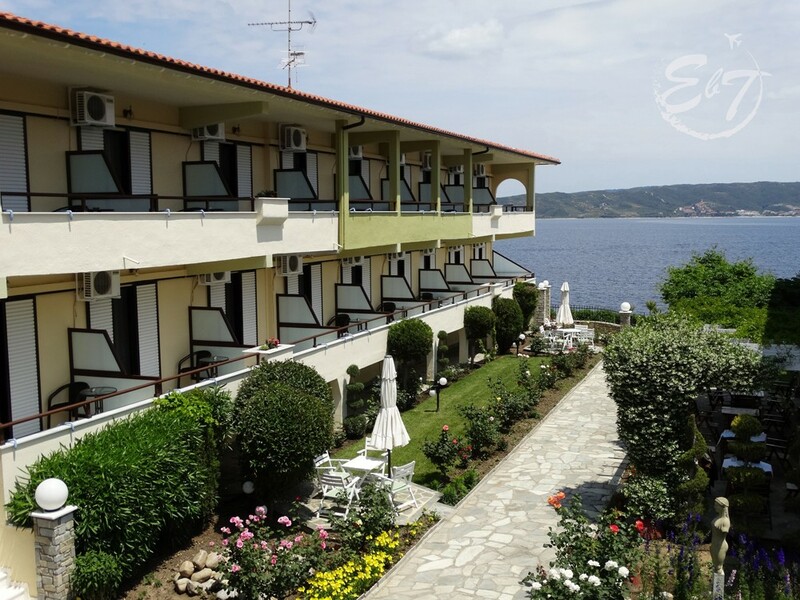 Sunrise Hotel is a 3-star complex which offers five type of rooms, breakfast, a stunning view from the balconies and an incredible garden decorated with perfumed flowers such as roses and sweet mock-orange. Immediately as we arrive, we were so impressed by the garden which looked stunningly beautiful. Our hosts welcomed us with a cup of a local drink. I noticed that the hotel is very clean, tidy and cared. Te prices start from 42€ for the single room and 75€ for the triple room. Prices may vary in high season, Also, the rooms with sea view are a little bit more expensive. I had a such a nice surprise to see that I have some meals to chose. It is not a complicated breakfast, but you have salad, feta, butter, olives, omelet, sausages, cheese and some cold meats such as ham and salami. As for sweets, you have cookies, marmalade and cake. Every morning you have good coffee and delicious orange juice. In may 2017, the rooms in the reception building are completely renovated. I visited those rooms and all is new: tiles, faience, furniture, sanitary ware, mirrors. Even the mattresses were in foil. The hotel has a rate of 9.2 on Booking and it’s 100% booked in high season, beeing one of the tourist’s favorite places in Ammouliani. You can check it here and here.